In November of 2000, I adopted Moe (found on page 5 of the AWA Success Stories). 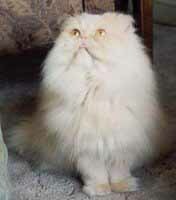 Moe was an apricot coloured Persian cat who had unfortunately experienced some hardships in his past. Moe was not very trusting of people. It didn't take very long, however, before Moe adopted my husband and I. Moe was a wonderful little cat and we spoiled him proper. From Hamilton we moved to Ottawa. 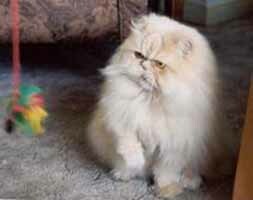 It was while in Ottawa that Moe was diagnosed with feline inflammatory bowel disease. We recently moved to Winnipeg this past December. Moe's health continued to deteriorate until my husband and I had to put him down. In the end his giant personality could not overcome his frail little body. Fortunately he suffered little. We miss him dearly and words cannot describe the loss of such a great friend. He was a very happy cat while he spent his few years with us and he always knew how to put a smile on my face. And while our time together was too short, I wouldn't trade those years for anything. We will forever miss this little guy. He was so very special to us and such an integral member of our family. Thank you for your services that makes it possible to foster pets until they are adopted into a loving home. Thank you also for giving Moe such an appropriate name. It was the name we continued to use as it suited him so well.